Especially here in the USA, we get a lot of our identity from our profession. In my case, I’m a guy who helps people buy and sell businesses. I help people who want to be business owners find and purchase the right company for them, and I help business owners sell their companies. This doesn’t mean that’s ALL I do, let alone that it’s all I am, but for at least 10 hours every weekday day my mind is on how to achieve those transactional outcomes. Although our clients rarely use these words, when they are making decisions about dealmaking, they are deciding who they want to be and what aspect of their identity is most important to them. They are using their money to decide their future. This is different than putting money anonymously “in the market” – it is much more personal. When our clients put their life savings at risk to bet on themselves, the decision becomes much more emotional than a mere business decision. For those who manage to do it and make a life for themselves as business owners, the ride can become an identity they never want to change. For example, we’ve never closed a deal with someone over the age of 70. For whatever reason, the business owners we’ve met aged 70 or over no longer will leave their company voluntarily. They love to flirt but they don’t get deals done. Can You Even Consider Doing Something Else?? “When a certain range of issues and ways of thinking become entrenched, it means that others start to feel awkward and even threatening” (Book of Life). 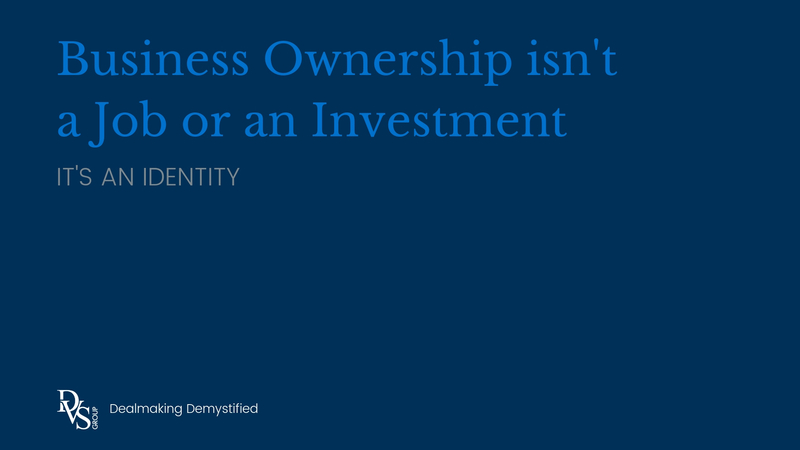 We often joke that business owners are “unemployable” because after donning the business owner identity for any amount of time, it becomes nearly impossible to slip into any other identity. That’s one reason why we found “identity bridging” strategies intriguing. Developed by a team at the Harvard Business School, these strategies are meant to ease the transition into retirement. Retirement can be a shocking existential change – one retirees, especially exiting business owners, often aren’t expecting. When you own a business, you can’t quit and you can’t get fired. How much more powerful is your sense of identity knowing what’s at stake? There are seven “identity bridging” strategies the research team has discovered so far. These strategies could be useful in many transitions – in or out of business ownership included. A grandmother who saw her grandchildren only on weekends might start caring for them regularly on weekdays. One person had put aside motorcycling for 25 years, but before retirement, he bought a new motorcycle to reawaken his biker identity. One man who said in an early interview that work had defined ‘who he was’ ended up saying a year later that he had never really identified with his career, that work was just for pay, and that his self-concept as a family man was—and had always been—most important. A retired engineer threw himself into doing hands-on engineering work as a volunteer for the new community center being built in town. One woman who had been mentoring junior workers at her old firm volunteered her coaching services through a community organization. These bridging strategies create something a business seller can move towards rather than only thinking about the loss of what they know inside their company. Our clients, both buyers and sellers, often need our help to recognize and process their changing identity. We count it a privilege to walk through those questions with them.